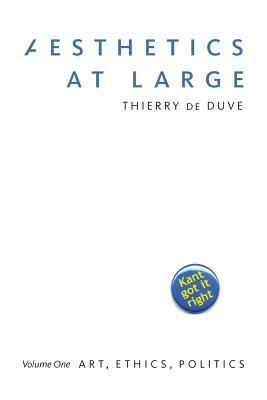 Immanuel Kant’s Critique of Judgment, Thierry de Duve argues in the first volume of Aesthetics at Large, is as relevant to the appreciation of art today as it was to the enjoyment of beautiful nature in 1790. Going against the grain of all aesthetic theories situated in the Hegelian tradition, this provocative thesis, which already guided de Duve’s groundbreaking book Kant After Duchamp (1996), is here pursued in order to demonstrate that far from confining aesthetics to a stifling formalism isolated from all worldly concerns, Kant’s guidance urgently opens the understanding of art onto ethics and politics. Central to de Duve’s re-reading of the Critique of Judgment is Kant’s idea of sensus communis, ultimately interpreted as the mere yet necessary idea that human beings are capable of living in peace with one another. De Duve pushes Kant’s skepticism to its limits by submitting the idea of sensus communis to various tests leading to questions such as: Do artists speak on behalf of all of us? Is art the transcendental ground of democracy? Or, Was Adorno right when he claimed that no poetry could be written after Auschwitz? Loaded with de Duve’s trademark blend of wit and erudition and written without jargon, these essays radically renew current approaches to some of the most burning issues raised by modern and contemporary art. They are indispensable reading for anyone with a deep interest in art, art history, or philosophical aesthetics. Thierry de Duve is Evelyn Kranes Kossak Professor at Hunter College, City University of New York, and Professor Emeritus from the University of Lille 3. He has served as a visiting professor at the Institute of Fine Arts (NYU), UCLA, the University of Texas at Austin, the University of Pennsylvania, Johns Hopkins, and MIT, as well as at various foreign universities on three continents. He is the author of numerous books, including Clement Greenberg Between the Lines and Sewn in the Sweatshops of Marx, both published by the University of Chicago Press.